After seven iterations, it would take something special to keep the produce of a franchise fresh: in the case of films, the cinematographic tropes used by the director of the series would become known to the watcher, perhaps to the point of them tiring of them; in the case of books, the sort of narrative twists employed by the writer become incredibly predictable; and in games, the general formula of the gameplay becomes second nature to the player even in the first iteration of the franchise. Given the interactive nature of games, the problem is greater: the sort of muscle memory-type learning that can occur from the use of any input device could scupper the subtle ways in which differentiation has occurred from the previous title. Ridge Racer 7 is magical: it is the same formula as the game has had for the last eighteen years, but the feeling of the game’s racing is simply stellar enough for it to still hold the same sense of wonder as the first title inspired. Things have been added to the basic formula of the game since its inception, of course, but these merely serve as window dressing to the incredibly solid arcade racing experience. 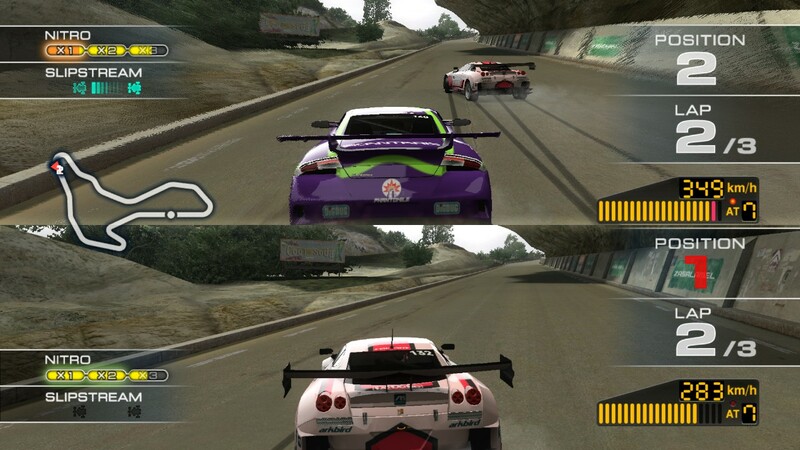 The Ridge Racer series is that wonderfully rare species of game: it relies upon drifting rather than careful driving, and rarely requires the use of the car’s brakes. Unrealistic, of course, but there is simply no other racing game that so wonderfully conveys a sense of speed in the way that the Ridge Racer series has and this is something that has not changed in the slightest for Ridge Racer 7. The blindingly beautiful visuals help to no end in this: the tail-lights of opponents blur in front of the player as they change direction, while the over-detailed and wonderfully clean backdrops pass by at a blistering pace. Accelerate, turn, release accelerator, drift, accelerate and straighten out the car: a simple pattern maybe, but one that demands the utmost attention at all times in order that the player perform well. This makes for wonderfully engaging gameplay, the concentration required derailed by the intrinsically distracting nature of the incredibly well rendered cars, visual effects surrounding them and the minimal but aesthetically pleasing heads-up display. The game teases “play me, but don’t look at how pretty I am,” the brazen whore. This is even before the player realises that this is not all there is to the gameplay: when you notice the little ways in which the game rewards playing the game its way, joy is unconfined. Long, high-speed drifting leads to the reward of charging up nitrous tanks and staying tight to the rear of competitors’ cars leads to increased speeds, constituting a nice little nod to aerodynamics: learn the game, gain the benefits. Then it strikes you that there are three different ways to race in the game, dependent upon the manufacturer of car chosen: standard, dynamic and mild drift styles all handle differently and change how race strategy is put into practice. A surprising level of depth hides behind seemingly simple game mechanics and that is no bad thing. Even the menu-driven aspects of the game are wonderful. 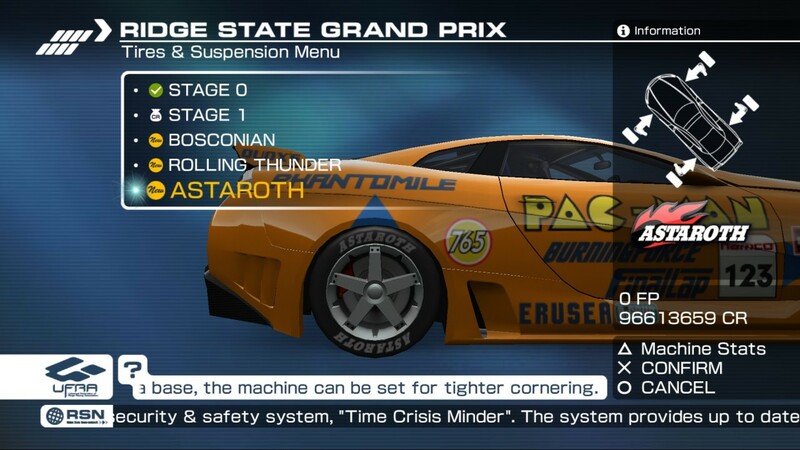 There is the standard selection of game modes on display: a time trial mode that offers to rain your times against players from all over the world; a Grand Prix mode that offers a series of challenges with a view to gaining in-game Fame Points and credits with which to purchase new classes of cars (as ever, Ridge Racer 7 classifies all cars into five classes, with this ranking reflecting the top speed of the cars), which enables the player to modify their cars with custom decals, new engine parts and countless other changes; Extreme Battle mode, which presents some of the toughest special races in modern racing game history; and a well-stocked multiplayer mode which takes in elements of all of the other modes. Again, hidden depth is the watchword here: peer beneath the tragically, wonderfully beautiful exterior of the game and it is inevitable that it will be found that the game is definitely not a case of style over substance. Finding something to decry about the game is an effort of its own: everything hangs together extremely well, with the soundtrack complimenting the on-screen action wonderfully, from the rockier background music to the gentle revving of the engines. Gameplay as complex as the player wishes it to be: play absent mindedly or look to maximise the nitrous yield from every corner – it is up to the player and, though in different ways, the game will reward the player for either decision. There is so much on offer here, when merely the online time-trial mode would be enough to keep people playing: one would despair to think how much time has been lost to repeating the same tracks over and over again in an attempt to shave that hundredth of a second off a personal best time in order to climb a couple of spaces on the worldwide leaderboard. Ridge Racer 7 is simply racing bliss. Bliss.